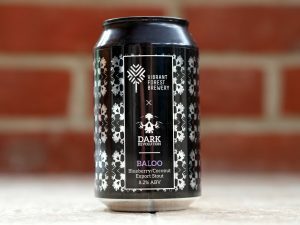 For something that appears to be named after Disney’s affable bear from The Jungle Book, this beer looks pretty forbidding: it comes in a jet black can festooned with skulls. It’s a collaboration brew between Vibrant Forest and Dark Revolution. As is often the case with these meetings of minds, it’s a bit of an oddball. It looks no less sinister once you’ve poured it – obsidian in colour, and topped with a shaving-foam head that bears an alarming purple tinge. On the tongue it tastes of coffee and blueberries, borne aloft on a raft of booze. There’s a hint of vanilla under all those powerful flavours, which I reckon must be the coconut, though I wouldn’t know it was there if it wasn’t announced on the label. The texture is as heavy and smooth as a Jimi Hendrix guitar solo, and the aftertaste is juicy, as you might expect from the addition of all that fruit. Curiously enough, it reminds me of a really nice cough medicine. Is it a bit weird? Yes, but all this experimentation doesn’t stop it from also being rather good.